TabSuggest, is a browser tool which enables the browser to show relevant content tabs (maximum of 5) by temporarily grouping & previewing them upfront. 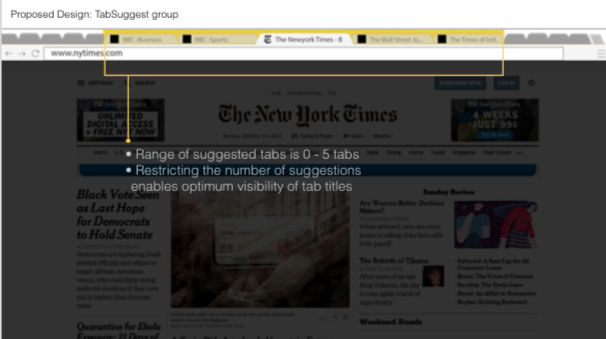 TabSuggest algorithm creates a tabs-group based on the current tab so that the user can quickly discover related content without spending too much time and effort in finding and navigating through all the opened tabs. As a final project for Cybernetics/Systems Design, I chose to explore how enabling unlimited number of opened tabs has affected the quality of web search. Thinking of it from the interface design & usability perspective, I felt, opening more than eight tabs affects the quality of web browsing by increasing the time and effort required to find and consume content in each tab. The proposed product resolves this visual and cognitive challenges without restricting the number of tabs and improve content consumption in browser. The systems works as a double feedback loop where browser processes input from the user’s current browsing context and continuously looks for related content in other opened tabs and if the time spent on a webpage is considerable, lets say, greater than 60 seconds, the browser triggers ‘TabSuggest’ to push these related tabs as suggestions in user’s current context i.e. active tab.